Loss of power, Internet, or data can be a crippling blow for many businesses. Here’s what you can do to prevent it. Many of us take modern utilities for granted. The water runs when we turn on the tap, the lights turn on when we flip a switch, and the Internet works when we fire up our computers. But because we so often take these things for granted, many of us are at a loss when the fail. In our personal lives, most of us can get through a power loss—even one that lasts a couple days—without more than minor inconvenience. But when it comes to business, even temporary outages can cost tens of thousands of dollars. And they’ve happened to almost everyone. Back in 2013, Amazon went down for about 30 minutes, costing them an estimated nearly 2 million USD in lost sales, based on quarterly revenue reports. Your business may not be as big as Amazon, but it also doesn’t have the brand power or the same economic mobility to recover after a significant failure. All this means that, while small businesses are often at risk for some measure of downtime, they’re less able to cope with negative consequences should one occur. If a power outage interrupts a crucial business call, the client or prospective sale may decide your firm isn’t reliable enough. Or if a blip in connectivity causes you to lose crucial files, it could spell disaster for your company. Fortunately, the most common threats to uptime are also the most preventable. 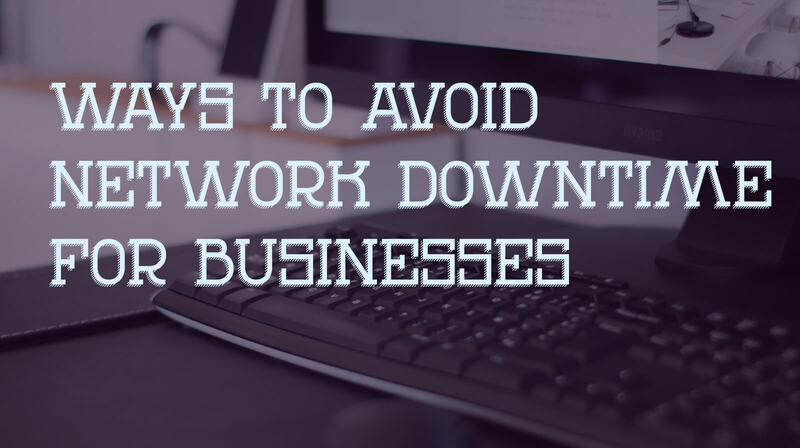 Here are the top 5 ways to prevent network downtime for your business. 1. Examine your system for both external and internal weaknesses. If your business experiences downtime, the first thing to do is look at where the problem originated. For instance, if your entire office is suddenly out of power, you need to know if it’s the result of a blown fuse or a more widespread failure. Without answering that question, you won’t know how to resolve the problem. Similarly, when strengthening your system against downtime, think about both external and internal threats. It’s no use protecting yourself against a massive hacking attack if your network could go down because someone tripped over a power cord. 2. Opt for enterprise-level network infrastructure. Some businesses try to save on costs by opting for lower-grade hardware. This is almost always a bad call, since the cost of an enterprise-level upgrade is minimal compared to what your business stands to lose if your network fails. Furthermore, higher-grade equipment helps maintain reliability, meaning that your employees won’t lose productivity due to a slow connection. While enterprise-grade Internet connections used to be more expensive, the price of fiber optic cable has dropped steeply in the past few years, making it an affordable option even for small businesses. 3. Have a redundant network connection. Some businesses can manage a loss in Internet connectivity for a few hours, even if it is inconvenient. But if your business absolutely depends on having constant access, then a redundant connection is the wisest option. But a redundant connection doesn’t just mean wireless and wired connections if they’re through the same provider. Instead, a redundant connection uses different providers and network carriers. This means that, even if one network experiences difficulties, the other network can pick up the slack. 4. Employ a backup power connection. Every building loses power at some time or another. An unexpected power failure that happens in the middle of a work day could cause your employees to lose hours of unsaved work. Even if it only takes a few seconds for generators to come online, that brief interruption could mean hundreds of lost files. This scenario can be easily prevented through use of an Uninterruptible Power Supply (UPS). A UPS provides backup battery power to your IT systems which kicks in the moment regular power goes offline. Through a UPS, any loss of power will immediately transfer to the battery supply, without any noticeable interruption from the user. That said, a UPS only has a limited supply, usually of a few hours. It will tide you over through temporary power failures, but for anything that might last longer, it’s smart to have backup generators as well. Almost every region in the United States has experienced large-scale blackouts over the past few years, so backup power is a wise investment, even if you don’t think you’ll need it very often. 5. Switch to cloud or colocation services. Did you have your office servers hooked up to a power source without a surge protector during a massive lighting storm? What about if a tornado, flood, fire, or other natural disaster destroys your building? These events can lead to massive data loss, and while they may be rare, the likelihood of recovering your business after such an event is slim to none. However, one crucial way to prevent these scenarios from decimating your business is not to use your business as the primary location for key documents in the first place. Cloud servers, which are housed in colocation centers, are not only more convenient and reliable due to their easy accessibility, they’re also safer. Colocation centers usually create backup copies in diverse geological regions so that a major event, like an earthquake, doesn’t result data loss for a client. And their buildings are structured to be able to withstand all but the most devastating natural disasters. They also employ location security to prevent data theft, and have tech teams on hand to manage any possible problem. Know who to turn to when your network does go down. It’s difficult to prevent all network downtime. Even with precautions in place, it’s not possible to predict every possible circumstance that might cause a disruption in your services. Having a good plan in place can shorten the time you spend out of service, but it won’t help you if you can’t identify the cause of your network failure. This is where a managed IT company can help both in monitoring of your network, and in responding in times of emergency. At Brightline IT, we offer managed IT services that include remote monitoring and maintenance. If you have concerns about your network, we can run a free network assessment to help you understand ways to improve network stability. And if you’re experiencing an IT emergency, we can be on hand to help resolve the crisis.